ART DESIGN INTERNATIONAL VOILA HIGH BACK EXECUTIVE OFFICE CHAIR | ADI | Alliance Interiors Inc. The VOILA chair comes with a three dimensional knit back that distributes weight evenly in all directions. This allows the knit back to self-adjust and take the shape of the users. The VOILÀ seat is available in a variety of regular and recycled fabrics, PVC free synthetic leather or in leather. The back is offered in 8 knit colors. The VOILÀ is offered with a fixed or adjustable back, 3 seat sizes, 4 cylinder heights and many types of mechanisms, from the simple swivel to the multi-function, with or w/o a seat slider. Optional lumbar and visco-elastic foam on the seat add to the comfort of the chair. Many models of fixed or adjustable arms (height/width, pivoting, retractable) are available, as well as a choice of resin or aluminum bases and various casters. All models are available in black or polished aluminum finish. 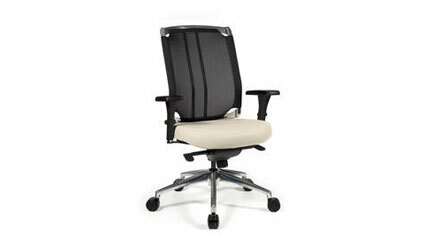 This is one of the most popular chairs within the ADI seating line. This is a chair that fits just about every size of user. The ADI Voila High back gives a modern contemporary look to any office environment while providing superior seating comfort. The Voila Chair offers a range of ergonomic features, recycled fabrics and finishes. It is available with 60 different mesh colors so you can add a unique look to any office. I have used the Voila chair for small home offices, boardrooms, training rooms, hotel rooms, showrooms, executive offices, workstations and in any office environment where there is a computer user. The “Voila” task chair is approved by the Federal Government on the Master National Standing Offer. The beauty of this chair is that all of the parts can be replaced such as the seat cushion and arms. This chair will never hit a landfill. The solid steel frame and unique suspension system in the seat pan allow the user to sit for long periods of time in total comfort.